Should kids play with their food? French kids are very tidy eaters (just like their parents). They are not allowed to play with their food, or eat with their fingers (except for things that adults also consider to be ‘finger food’). My daughters had a hard time adjusting to this (as did I). Before we moved to France, when my first daughter was learning to eat, I allowed her to play with her food. That’s what it said I should do in the North American parenting books. So I covered the floor with plastic wrap or newspapers, handed her a bowl (or put the food right on her tray), stood back, and let her go at it. What you see in the photo was the typical result. Later, I realized that the French approach is pretty smart. Until a child can feed themselves tidily, an adult will feed them. When they practice eating, an adult will help them learn how to eat without spilling. 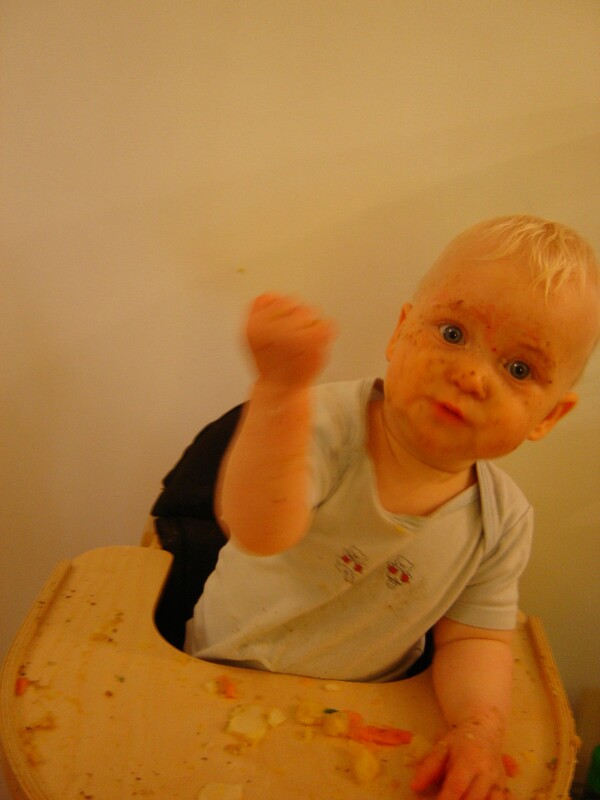 By the age of 18 months, French kids are tidy eaters. So they develop a respectful attitude towards the table (and themselves). There’s less cleanup afterwards. And they’re more fun to eat with: who wants to look at that mess while eating? So with our second daughter, we used the French approach. By the time she was one and a half, she was very good at feeding herself very tidily. Now, nearly three years later, she still eats more tidily than her older sister. She automatically knows how to position her body and her plate, and how to hold her utensils. She’s learned how to eat without a mess. But we still have to remind her older sister about these things! Do you let your kids play with their food? If you do, at what age do you think they should stop? Oh, I really hope I keep this French way in mind when my husband and I have kids! I have always been so turned off by those messy faces with grimy hands and sticky counters that so many of my relatives and friends face when they feed their kids. I’ve never understood why it is accepted. It seems not to follow good reasoning to allow a child of any age to play with his or her food at certain times and then scold and punish him or her at others. I know so many people that think it is so cute, but I think it tends to be disgusting (except in rare cases) and reminds me of the little boy in A Christmas Story who snorts his food at dinner.